*Before reading this, please see this post to have a better understanding on what this book is about. Thank you. Pathology. A more or less temporary disorder of the mental faculties, as in fevers, disturbances of consciousness, or intoxication, characterized by restlessness, excitement, delusions, hallucinations, etc. Deliria. A disease despised by one whole society. Lena and her best friend, Hana, are attempting to make the best out of this summer, their last summer together. Their last summer before getting cured and numbed to everything. For Hana this means, trying out all the forbidden things, going to parties to listen to illegal music after curfew, having direct contact with uncured boys. Lena is devastated. Was this what she wanted to do with her summer? Apparently so. Ninety-five days before Lena's cure she meets a boy named Alex. He was cured. Lena started spending a lot of time with him, going to the beach while still keeping a fair distance and so on. That's okay though, because Alex is cured. Right? Wrong. On one of their trips to the beach, Alex confesses to Lena that he is an Invalid. An uncured. Diseased. He was given a new identity when he had arrived to Portland from The Wilds and the Resistors (people against the Cure and the government) had hacked into the Government's files, validating his citizen number. "Impossible. You have the scars." "Scars," he corrects me, a little more gently. "Just scars. Not the scars." He looks away then, giving me a view of his neck. "Three tiny scars, an inverted triangle. Easy to replicate. With a scalpel, a penknife, anything." After finding out the truth about Alex, Lena continues to meet up with him. She was in love with him. A forbidden word, a forbidden act. A couple days into their relationship, Lena reveals the truth about Alex to Hana. The truth that he is an Invalid and the truth that she was in love with him. Alex, Lena and Hana had formed a friendship altogether. They would go to the abandoned houses - one of them becoming their favourite, 37 Brooks - and have picnics, after work, after curfew. One night, when Lena makes plans to meet up with Alex at 37 Brooks to discuss their escape to the Wilds, they see that there is a lock on the gate. Lena automatically thinks that Alex would have done that to protect their stuff that was in there. Before he can protest, the regulators have caught them. I was so distracted by the fact that Lena and Alex were caught, I did not once think about how they were caught or how the regulators found out about them. The book Hana is just a short story. It is based on all the events that happen in the book Delirium except in Hana's point of view. In this book we see all the hardships that Hana has to go through as well, despite being rich. From not liking her cured Pair (the boy she is assigned to marry after college - if she decides to go) to finding out that the uncured boy she might love does not love her back. The ending of this book was quite shocking to me, it was a good flashback of the book Delirium as well. It also told us how Alex and Lena got caught. Rumors, persistent rumors: of Invalids, of resistance, of the growth of the disease, spreading its blackness amongst us. Every day, streets papered with more and more flyers. Rewards, reward, reward. A paper town, a paper world: paper rustling in the wind, whispering to me, hissing out a message of poison and jealousy. If you know something, do something. i haven't read this book but the way you explain it seems really interesting. Thanks for reviewing the series and sharing your thoughts on it! Exactly! The way the author described all the events were amazing and felt so realistic! 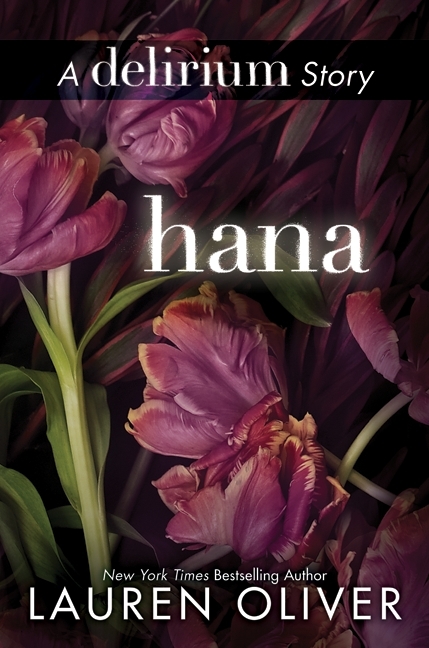 Unfortunately Hana is only an eBook so I had to buy it online!